I couldn't have picked a better blogger for my Earth day giveaway. Bhrett is the crunchiest, hippie blogger I know. I'm so glad she decided to join in this week. You can learn more about Bhrett here; she's pretty much awesome. I'm a wandering soul. My husband and I have just relocated for the fourth time in a year. Living the hand-made, fair-trade, thrift store-raid kind of life is what we do. I hope you'll hop on over to my blog and join our gypsy wagon as we seek out our path through this life. How cute is that!? 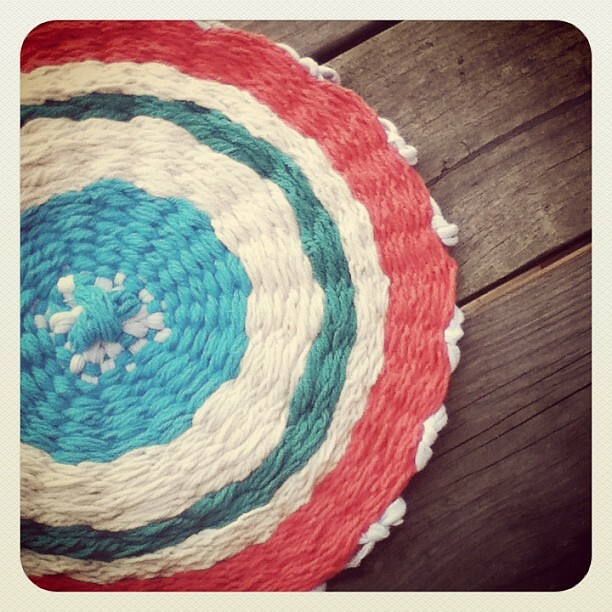 It's a handmade woven cotton centerpiece. Too cool. Follow Sweet Green Tangerine via GFC or Bloglovin and Lost in Relocation via GFC. Leave a comment to let us know you did and that's it! Done! That is super cute!